So it is safe to say my husband (and daughters) are a little obsessed over Disneyland. I give in to this obsession, because it is so hard not to, and because their delight is infectious! That being said, we have gone 4 times in the last 2 years, and I would consider us pros when it comes to navigating the magical land of mickey ears! I had a friend email me and ask what she should know as they prepared for their first trip with their two little ones. 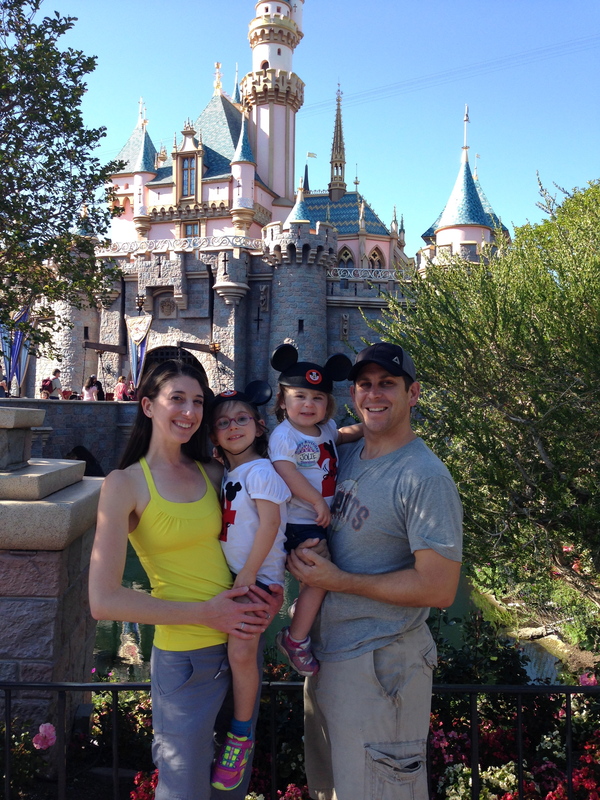 So, I saved my novel of a response to post to the blog when I had a moment, and the time has come – so here it goes…tips we have learned about making the best of your Disneyland and/or California Adventure experience! #1 – get there early. The crowds begin even before it opens, but you can actually get into Main Street a half hour before the rest of the park opens so that you can get right into some of the rides without long lines. We went on a Sunday just as the park opened and did Pirates of the Carribean, Haunted Mansion, and Jungle Book Cruise all in 20 minutes without lines, and yes, both girls did all those rides, with our noise blocking headphones, of course. #2 – pack lots of snacks, even a cooler with lunches. I buy those Horizon organic milk boxes that you don’t need to refrigerate for the kids, and bring water bottles. When we went we stayed in a hotel and had their continental breakfast and then brought stuff to make sandwiches and brought in lots of snacks, we really only bought dinner. And eat at CA Adventure, they have pretty decent food, compared to Disney. There is actually one nice place to eat at Disney – The Hungry Bear Cafe. Its the best location – way back by the Winnie the Pooh ride and Splash Mountain so less crowded and its on the “river” so the kids can eat and watch the ducks while you finish up, and its all shaded. Their fried green tomato sandwich and sweet potato fries are my fav! #3 – Child Swap pass – if there is a ride that only one child can go on (the other being too little, or rather, none of the little kids can go, you ask for the child swap pass from the staff in line and they let you (and the kid) ride while the other parent waits and then when the ride is over, your child can go again with the parent who had to wait with the younger child without having to wait in line again. Fortunatly most of the rides all age children can go on and babies will be able to ride on your lap or in a carrier. JoJo was 4 mos the first time we brought her and we just held her in the Ergo all day, and only brought a single stroller because it was easier to maneuver with crowds. If you are bringing a more expensive stroller bring a bike u-lock as I was told there can be theft of nicer strollers in theme parks…never actually heard of it truly happening, but you never know. #4 – See the parades/shows. The Disney Jr Show in CA Adventure is awesome, and so is their parade. The best place to see a parade in Disneyland is by the bathrooms across from the mater horn ride, right next to Alice in Wonderland – reason being, you sit against a wall, and there is no one behind you and you are up close to all the action, the characters will even come say hi and high-five the kids. Get that spot early though because people know when a parade starts and will reserve spots up to an hour before. We use it as a good rest time, snack time, and just sit and relax in our spot. #5 – Two secret air-conditioning spots to know. In Tomorrow Land the big round building Innoventions – next to Autopia – is a great place to walk around, sit inside to escape heat. Even better though is in CA Adventure, the Artists Studio ( I think that is the name) it is the lobby of the theater where you can see Turtle Talk (a cute little attraction/show) because it is a huge room with couches, dark/low lights, open space, and AC! I spent two hours in there with sleeping kids in strollers while adults swapped out riding roller coasters with Single Rider passes (another good way to ride some rides if you don’t mind going alone) and I ate ice cream…can’t mention enough of this place! #6 – Wait time apps. There are a few on iTunes and they seem to change each time we go, but we do get a free one and use it to guide us on the wait times of attractions. They aren’t always 100 percent accurate, but they do show you a good idea of what to skip or try next. #7 – get the souvenirs before hand. Whenever we go I hit the dollar bin at Target and other stores and try to find Disney toys/treats/t-shirts and a bag of goodies that I give to the girls when we arrive so they don’t want to buy every thing they see in the stores; because they just got a loot of new stuff that cost less than half of what you will pay in the theme parks. Oh, and glow sticks are great! I give them to the kids when it gets dark instead of paying gobs of money for the light up toys the sell everywhere. #8 – shortcuts. The shops on the right hand side of main street (leaving the park, if you face the entrance) all lead into each other, meaning there are no walls separating them, so if you get stuck at one end of Main st after fireworks, make your way into one of the stores and weave your way to the last shop, and it sometimes can be faster than trying to get out with the crowds down main st itself. Though, the stores can get crowded too. #9 – Fast Passes. Defninitely get fast passes for the rides that offer them. Beats waiting in line for them. The Cars Land ride runs out of the Fast Passes early in the day so try to grab it soon after you go in. And you can only hold one fast pass at a time…meaning if your fast pass says to return at 10am, you can’t get a fast pass for another ride until 10am. #10 – World of Color. If you are going to stay late, see World of Color at CA Adventure. worth the wait to get a good spot. This one you also need a fast pass for, but it is more for an area to sit in. We do a late dinner/snack and just go in early sit down and eat while we wait. #11 – Meeting Mickey. If you want to meet him, the characters are often in the front plaza on main street first thing in the mornings and around 2 (at least the last time we went) but Mickey is always at his house in Toon Town, which opens an hour after the rest of the park. So if the park opens at 9, we make our way to Toon Town at 9:45 to be there right as the gate opens, and head straight to Mickey’s house. It can be a long wait to see him if you don’t go pretty quickly after it opens. The rollar coaster in toon town is perfect for preschoolers too. #12 Photo Pass Plus- if you are going with a large group, and going to a character lunch you might consider purchasing it. We did because we split the cost of our pass with the family we were with. I think it is $70, but you get all the pic files and a 8×10 and wallets and 5×7 of the character meal photos. At many places around the park there are staff who will take your pic ( like in front of the castle) and they will just scan the card and load all the pics onto one account. They use nice cameras and can do fun effects to the pics too. We did it for our most recent trip and it was nice, and we have all the files now. Not necessity, but nice with a big group. Our favorite spot for pictures in front of the castle! #14 – be flexible. Not everything will go as planned, don’t have too much of an agenda, but do a have a possible plan of attack so you don’t end up going in circles, and try to roll with the punches. It can be a stressful, not the happiest place on earth, if there is too much stress on getting to here or there. Remember, you will (hopefully) come back so if you don’t get to it, oh well. Our first trip we tried to cram too much into, and everyone just got fussy. Its good if you have other kids with you to occupy your kids in line. We have found that going with other families is great – parents can take breaks together while others ride, and kids enjoy company. #15 – Plan at least a three day trip if you can, and do both parks. If you are coming from outside of Southern California you will want to spend at least 2 full days in the park in order to really feel like you made the trip worthwhile. And it is worth it to do the dual park pass, both Disney and CA Adventure. There is a lot about Disney that wasn’t done the best (like lack of seating and shade) that CA Adventure does well. Needless to say, all the awesome attractions CA Adventure has to offer, especially for the younger crowd. It is expensive enough, that to spend that much and not really make it worth your while is a waste. We like to travel to Disney one day, go to downtown Disney, do a character dinner and then start the next day bright and early at one of the parks. There are often magic morning passes that allow you to get in an hour early to parts of the parks if you have a three day pass and stay at a certain hotel. Another option is to do a character breakfast on the morning you leave so you can finish the trip with something fun! We have done 3 of the 4 character meals, and the best food so far was Goofy’s Kitchen, but the best overall experience was Mickey’s Surfs Up Breakfast. They are a great way to see a lot of characters at one time instead of waiting in lines at the park. Weekdays are always less crowded than weekends (except during the summer) so if you can go on a weekday, lines might be a bit shorter. Summer is always super crowded, and if you don’t like heat, don’t go in the summer. Anything over 90 degrees and the day just turns into misery, trying to escape the heat and keep everyone happy. On our first trip to Disney it was 104 degrees when we got there! We had fun, but keeping little ones happy in the heat isn’t always easy. When we went back in February, it was a thousand times more enjoyable! I should also mention there are crowd predictor websites for planning your trip. If you have the flexibility, you can plan your trip when the crowds are predicted to be lower than other days. Crowded Disney just means more time waiting in line, more people to maneuver and less time to actually enjoy the attractions. If you are going to spend that much on a ticket, its nice to be able to get the best experience you can! I hope these tips have provided a little bit of help in planning your Disney vacation! There are lots of blog posts about Disney out there, so read others and learn their tricks too! Every time we go I learn another thing to remember for future trips! Ah Disneyland, why do you have to be so intoxicating…all in a good way! This entry was posted in Disneyland, Traveling and tagged Disneyland, Tips for Travel. Bookmark the permalink. One Response to 15 Disneyland Tips and Tricks! Wow, this ia a very comprehensive list of helpful hints and tips! We were not Disneyland experts when Leah and her brother Zack were little, but I did discover one wonderful family-friendly spot by accident many, many years ago. It was called the Gerber House (or Place), but it is now called the Carnation Baby Care Center. The center is located at the end of Main Street and has many nice amenities — full changing tables complete with wipes, private nursing areas, rocking chairs, and child-sized toilets. I even remember that it had a great washing station, but I could be wrong. To me it was a quiet, safe refuge from the hustle and bustle of Disneyland. I always encourage families with small children to visit this center, because few people seem to know about it. Other amusement parks should create spots like this, too.